Celtic is a unique football club in many ways. Throughout its history one thing that has set Celtic apart from other clubs has been the fervour and commitment of the supporters, drawn initially from the Irish communities and Catholic parishes of Glasgow before widening out throughout Scotland to Ireland, England and ultimately, beyond the waves to other continents. Fanaticism was a key feature of the Celtic support from the earliest days. Attendances at the first Celtic Park and away grounds grew at an incredible rate and the Celtic fans quickly earned a reputation for being vociferous and colourful in their support. 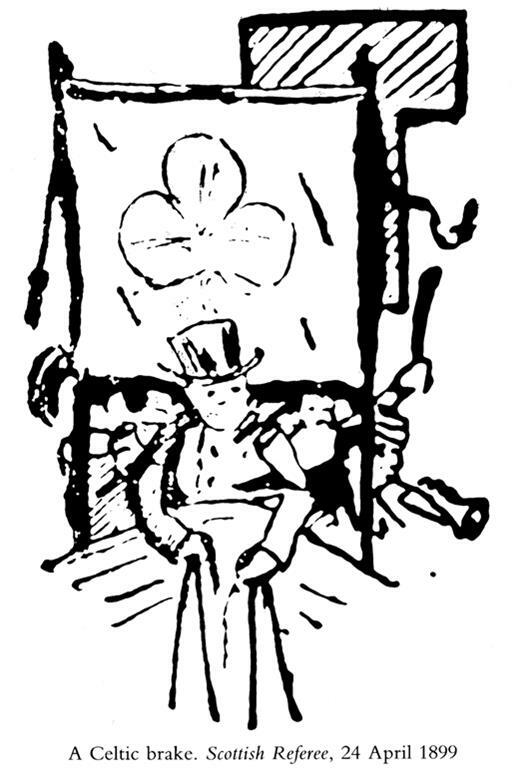 The magazine Scottish Referee proclaimed on 7 September 1891 that ‘The Celtic are blessed with having a following that simply defy the elements, whose enthusiasm for the club is never lukewarm.’ In early 1889, reporting on a home friendly, The Scotsman wrote of the Celtic fans that ‘The enthusiasm of the spectators was tremendous’. When Neil McCallum scored in the 1889 Scottish Cup Final one newspaper reported that the Celtic terracing was “a scene which simply baffles description”. The 1892 Scottish Cup final saw Celtic fans carry pipes into the game with ‘Play Up, Celts’ printed on them and some unfurled a large green banner proclaiming ‘Good old Celtic’! Hurry up!’. Official recognition even came from the SFA Annual of 1892/3 with a profile of the Celtic support of the day: “Good old Celts!” Such is the cry that greets them, such is the only expression that many an ardent follower can give to this feeling, wrapped up as they are entirely in “the bhoys”. Celtic supporters began to organise themselves into clubs with the first being formed in 1889 and based in St. Mary’s Parish in the Calton where the club itself was established two years earlier. The St. Mary’s Celtic Brake Club was attached to the non-alcohol Catholic temperance organisation, the League of the Cross. 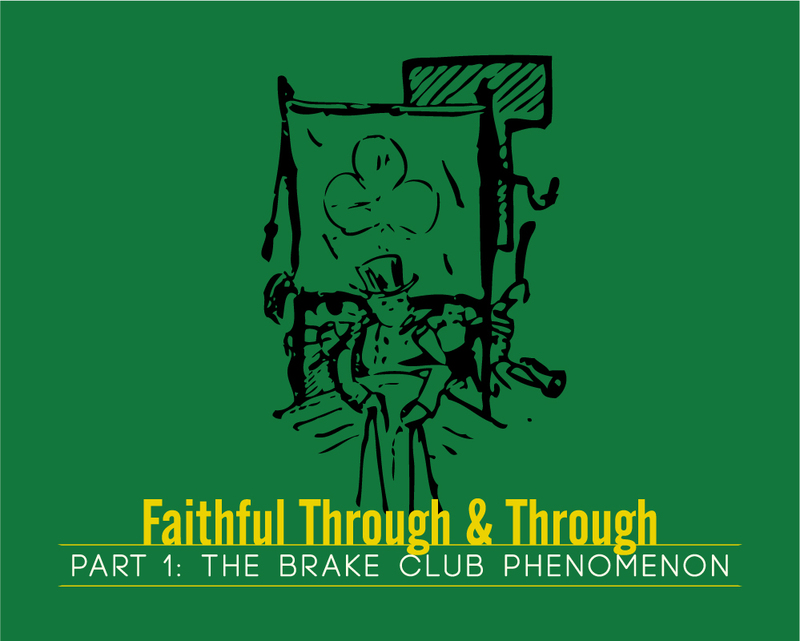 A ‘brake’ was the horse drawn carriage which was used to transport fans to the game and also allowed the club’s banners to be proudly displayed behind the driver for all to see where their loyalties lay. 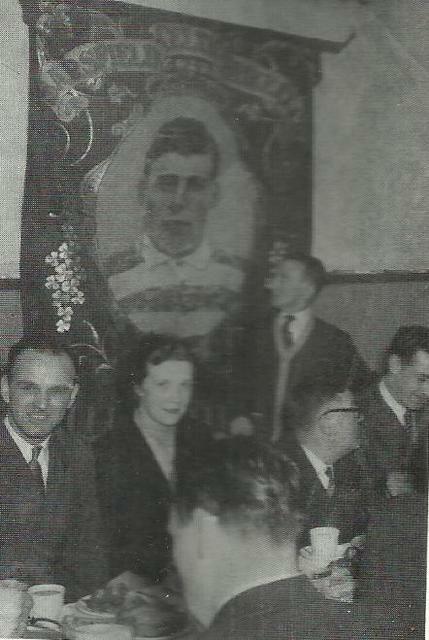 The original St. Mary’s Brake Club banner, which featured early Celtic hero Tom Maley, could – until recently – be viewed close to its spiritual home at Baird’s Bar in the Gallowgate. Domestic couples go by, carrying little parcels for each other, and making pleasant pictures of contentment. Shop girls, set free at four o’clock, are bent in the same direction. Matinees or afternoon concerts, “skailling” towards five o’clock, keep the westward-going throng thick and thicker. This is the hour when Renfield Street takes on its evening character. Quite suddenly you will hear a great clatter of wheels, and loud cries and shrill blasts of trumpets, and a brake full of men in “gravats” and “bunnets” rattles past you with a banner flying, and much clamour and loud chaff. These are the “fitba’ supporters new back frae their gem.” They are great strapping men, dight in their Sunday braws, and all belonging to the “Legion that never was ‘listed.” The business of their football club is other than to play. They “support”; they follow their team from field to field; they drive to and from the match in their brake; they wave their banner with the strange device – “Camlachie Shamrock ‘Celtic’ Football Club”; they roar obloquy and ridicule at any rival club whose brake may pass theirs. And they have solved, in a way, the problem of Happy Saturday Afternoons for the People. The Celtic stronghold of the Gorbals was home to the Sarsfield Brake Club, named after the famous Irish patriot Patrick Sarsfield. The story of the Sarsfield brake club banner is legendary – it was originally stolen in a ‘skirmish’ with an Orange march passing through the Gorbals in the World War One era, and repainted down the years to feature great Celtic players including Davie Hamilton, Joe Dodds and Stevie Chalmers. It was rumoured that, on occasion, Celtic players from the Gorbals would get the brake to and from the game. For many years the brake would leave from Teacher’s Pub in the Gorbals, on occasion led by the Sarsfield Flute Band. 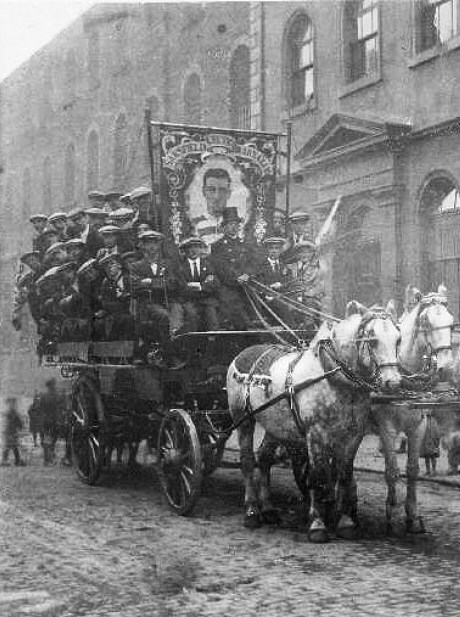 The famous banner, which was still in circulation in the 1960s, can be seen above on a packed brake getting ready to leave for the game, probably in the 1920s. It was through colour and noise that these early Celtic fans demonstrated that their support for the cause was unyielding. It is a tradition we should all be proud of. And one we should all be trying to maintain and enhance. If you liked that, you’ll probably like these . . .
Memories are made of this and passed on. Interesting by the 1930s, those in Gorbals who wanted to go by bus to an away Scottish Cup tie out of Glasgow were notified by chalk on a wall at Gorbals Cross. As told to me by my late father.